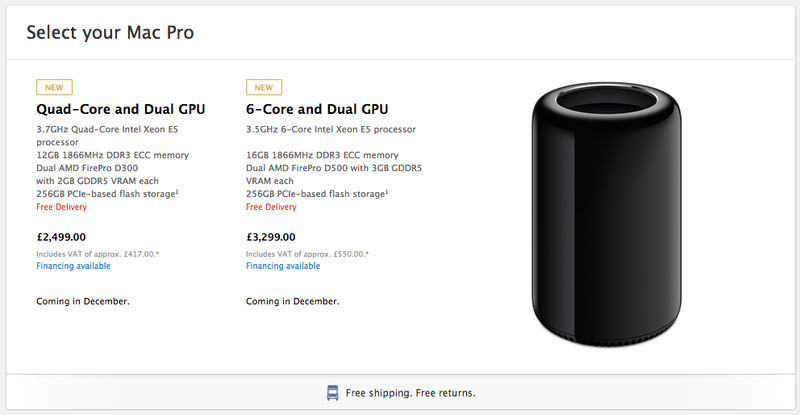 Mac pro thermal limitations ? notice how the hex core model has to drop 200 megahertz per core in speed from the quad core machines so effectively your loosing 1.2ghz of power over all the cores, compared to the quad core ? this to me implies its been clocked down so as to prevent high temps and high fan speeds when at the same clock speed ? ie thermally the system cant handle running 6 cores at the same clock speed as the 4 core, it just cant dissipate that heat fast enough from 6 cores at 3.7ghz without becoming noisy ? this is usual with apple in the sense, they limit fan speeds and clock speeds whilst having higher acceptable temp envelopes for more quietness, versus performance on systems with limited cooling, even then my suspicion would be that they as per usual they will prefer to run the SMC BGA CPU and GPU cores at higher temps for quietnesses sake. Compared to say a person who watercooled their PC whos looking for idle temps from 30 to 40 degrees on most components for longevity and overclock-ability headrooms sake, but since sandy bridge intel have screwed us over on getting close to 5ghz with bad IHS soldering methods. on their CPU’s in general even though the silicon sufficiently cooled can do it. Admittedly its harder to remove heat from more cores on the same die but still … it aint great. On a PC you can upgrade the cooling since this design is centered round the cooling from a design perspective theres little you can do to upgrade it. Standards hmm michelin stars might be a technical measure for wealthy diners, but the system cannot account for the heart or flavours that can be found in all the places of the culinary world. Apprenticed﻿ to a chef who if born english played his french origin’s for they’re worth, and gordon sucking up to him and the great french system, yes french cooking has some highs, but its love of it’s own reflection has disabled it from being as fleet footed in innovation as other nations culinarily. SOLUTION THAT WORKED FOR ME WITH ATI X1000 kext enabled, 2 copper coins fixes it !!!!!!!! 2 x 2 pence peices or equivalent dimension copper coins to 2p UK currency or theyre equivalent material and dimensions in copper foreign currency. 2 x double side sticky sponge pads smaller than the coins but sufficient to hold them I used sellotape sticky pads 19mm x 19mm with 2p coins. 5: Reassemble as per usual making sure to do up all screws nice and tight especially the four long philips case screws on the rear of the back case, you may have to squeeze the the two halfs of the case together a bit especially at the location on the case where the screw is closest to the copper coins, once you have all screws in tight, with the extra pressure of the copper coin heatsinks you are applying to the vram chips, they will now make better contact to the logic board, and therefore now work correctly!, I know this sounds ridiculous but it actually worked completely for me, I now have my x1600 working properly ! with ATI X1000 kext functioning with no glitches, Its also worth noting I have copper shimmed the chips on the reverse and redone thermal paste prior to this but it did not not resolve the problem of glitching until I applied pressure to the vram chips in this manner. The problem was only resolved when I applied the two pence peices to the vram chips, which I beleive is the cause all along, Im guessing this means that perhaps a bake of the motherboard might resolve the issue with the vram smc bga chips, as mere pressure onto these chips seems to resolve it! experiment at your own lesiure report back results, but im personally very chuffed with this result. I hope this helps someone ? perhaps I spoke too soon worked for 60 mins worth of video watching on vimeo and youtube, QE CI working as getting droplet effects working in dashbaord when placing widgets etc – then I had a hang in safari – no glitching screen at all though and none after reboot either ? justa straight hang, gonna try a fresh reinstall as maybe I have allot of stuff that was corrupted from the time i was running with the glitching video, and as ian cheong instructions states maybe some files need clearing out as maybe corrupted from previous times ? I also note that my repair though fixing also puts a low profile bulge in the keyboard, as basically my method is to sandwich the chips tighter onto the logic board and the copper coins/shims take up space, just rebooted conducting testing now tightening the screws a little further. will report back how stable fix is temps are very low cpu core on video browser use 38degc did use arctic cooling mx2 thermal paste properly and thinly applied. Ok update I cleared out corrupt preferences as per ian cheong instructions did an smc and pram reset, did a gigs worth of OS updates to 10.6.8 for 45 minutes no screen glitches of any kind, it certainly seems as if pressure on the vram chips has massively improved the situation by at least 90% its kind of night and day compared to before with no pressure on the vram chips, ie until I get the hang there is literally no screen corruption of any kind ? but I am not at all 100% stable. Pity so many hot surface mount BGA chip packages are used on thin logic boards as they are prone to failure within a few years of purchase, and lead free solder did not help the issue, well manufacturers dont seem to care about such design flaws. the logic board on a macbook is too flexible imo and the case not rigid enough, the unitbody macbooks helped these issues, bu theyre still to thin not cooled well enough and I doubt with thick enough logic boards either. so im guessing the next step is a bake of the board, probably using g clamps to apply pressure to both the vram chips and the gpu chip at the same time whilst being baked, as I think pressure and baking might be the only 100% way, relying on just one or the other is going to leave me at around 90%. i should imagine as the bga solder balls need to be forced into firm contact whilst the solder is made fluid and recooled, not sure if I have the energy for the operation as this is not worth it time wise. I kind of have it 90% stable, im using the penny trick on the vram chips, new thermal paste and a copper shim on the gpu chip, im using “Fan Control” system preference from macupdate, to set a fan profile ramp from a lower threshold 48 degc to 70degc for max fan rpm, and minimum fan rpm 3100rpm, im using temperature monitor lite set to open at login so I can keep an eye on all temps in the menu bar, I am also using SmcFanControl as fan speed readout in the menu bar, I tend to find though I have no graphic glitches during machine use when the temps get high watching full screen video for an hour or I may get a lockup, if I Avoid full screen and probably though not tested I also suspect full screen 3d games I dont get any lockups during normal use, which is a darn site better than beofre where the machine was display glitching on boot to desktop.